We’re speaking about millions and millions of potential customers that might hear about a bad experience which could significantly reduce your chance for bigger growth. However, some brands choose to ignore customer care for many reasons: lack of time, people, resources, money, or they simply think that they don’t need that. Here’s what happens when businesses don’t pay attention to customer care. In a study by Zendesk 95% of respondents said they tell at least one other person about bad customer experience with a company while half of them share it with at least 5. That same study says that 88% of people are influenced by review online when making a buying decision. I can’t count the times I’ve reached out to a business on Facebook or Twitter with a few questions and never heard back. A super frustrating experience which made me choose a competitor of theirs and never look back. Another negative side effect of bad customer support is losing your best employees because of bad reputation online. When your company has a customer service problem it might lead your top performers to jump ship when they realize things are going south. Also here are some “fancy” social media customer service-related statistics for you to consider. As of last year, at least 86% of Fortune 500 companies have an active Twitter account, and more than 50 million small businesses use Facebook to connect with consumers. Yes, you can win social media with exceptional customer support but there’s a lot of mistakes you need to avoid. Don’t worry though because that’s exactly how I plan to help through this piece. Your customers want to be heard right away and if they have a complaint they’ll make sure everyone in the world knows about it, including you. Sadly, sometimes you may upset customers so bad that they forget to tag you in their post. That’s why it’s super important to constantly monitor your brand with both mention of the account and mention of the name. It’s your job to make sure you see their message. 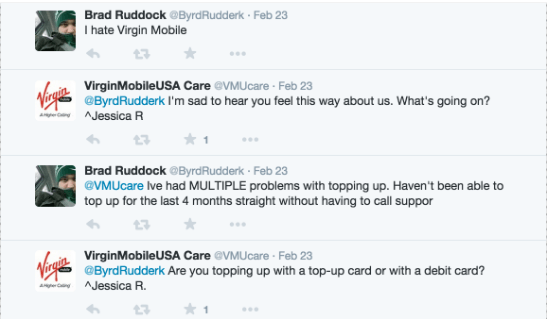 Above is an excellent example of the way Virgin Mobile monitors its brand at all times. I’m sure this made a great impression on Brad Ruddock and helped avoid a potential PR crisis that might’ve happened. It shows you’re paying attention and you care. 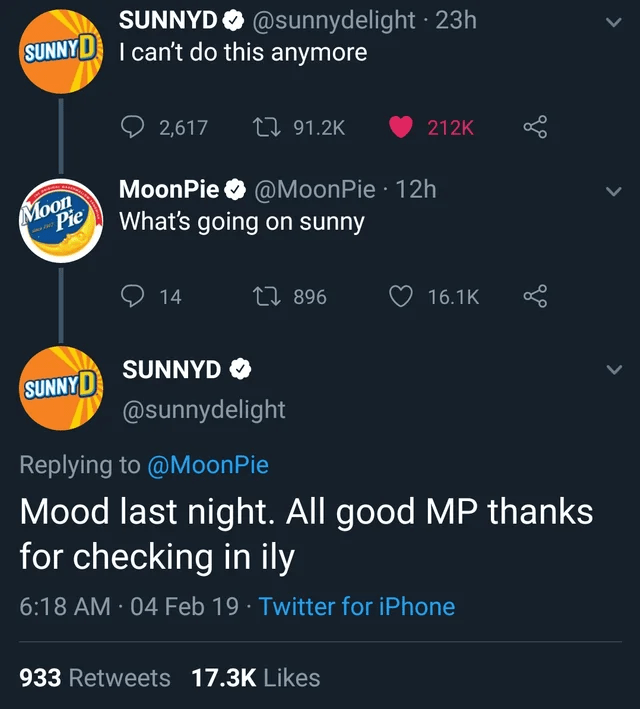 Frankly, when brands do that to me – I’m not even mad anymore. A happily resolved customer interaction will reward your brand in one way or another. It might be through shares and engagement, it might be through loyalty, or brand advocacy like in the example below from Zappos. It will significantly promote the way your brand communicates online and will higher up your chances for a decision to upgrade or purchase the product. I’ve been interacting with hundreds of brands over the past year as I’m constantly testing new tools, platforms, and products. It’s really easy to make a bad impression of customer care. Sometimes it feels like the brand doesn’t even care about you when brands could improve 10x their efforts of customer care by following this simple secret – follow up! It’s easy and takes less than a minute to write a follow-up message to a user you had conversations with. It seems like you’re all set here for now, but don’t hesitate to reach back if you have any other questions! We can continue right where we left off. Just circling back here to see if you would like any other help on this? I hope you’re well. I was wondering if everything works fine on your end and if there’s anything else we can help you with today. Just checking in on my last message. I’ve passed your feedback onto the team about your issue. If there is anything else I can help you with please do let me know. I just wanted to touch base with you to see if my above message helped? If you’re not a corporate serious account (and few actually are), feel free to use all the internet resources you can, like memes, viral videos, emojis, GIFs, jokes, and other ways of creating a more entertaining conversation with your audience to grab their attention. However, it’s easy to overdo it – don’t fall into this trap. 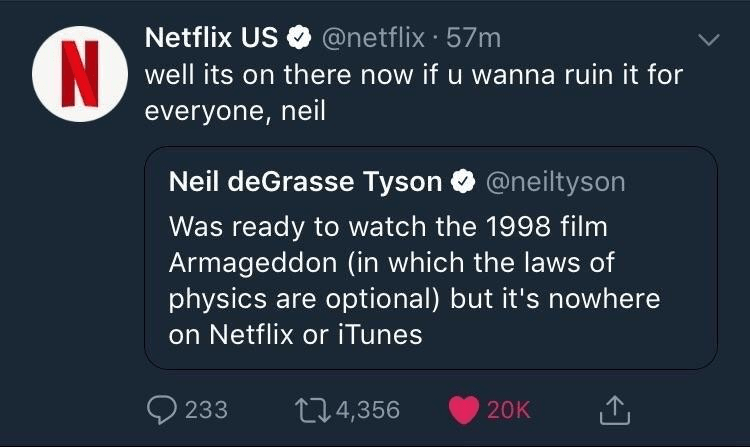 NGT is almost like a meme on the internet and that’s what Netflix US team knows. By digging up a tweet that’s 5 (FIVE) years old and then retweeting it they just created new buzz on social media. Interact with customers and show them that you are – the key to a successful brand on social media. On the other side if someone doesn’t like you just accept it in your own way. 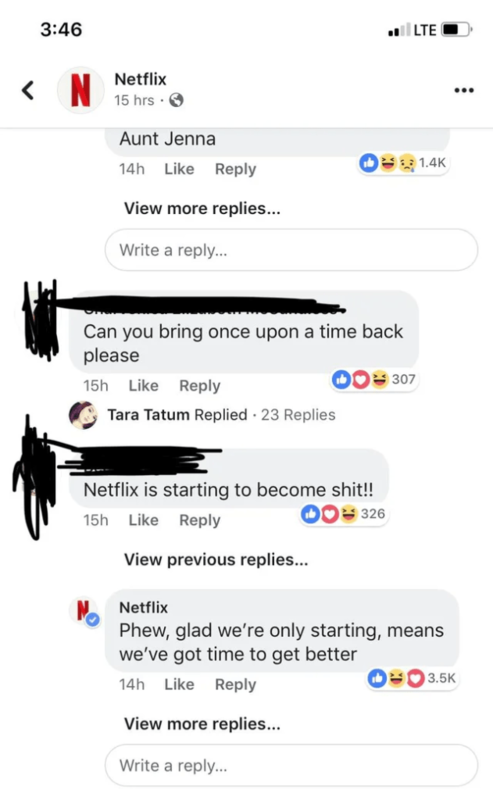 Netflix social team is known for good content & copy but this is just brilliant. It’s already hard enough to stay serious and professional all the time on social media when interacting with your customers & users. Sometimes you just need to dress more casual and be a human by interacting with other brands to drive attention to your brand. It’s also a form of customer care. Here are just a few examples I love. 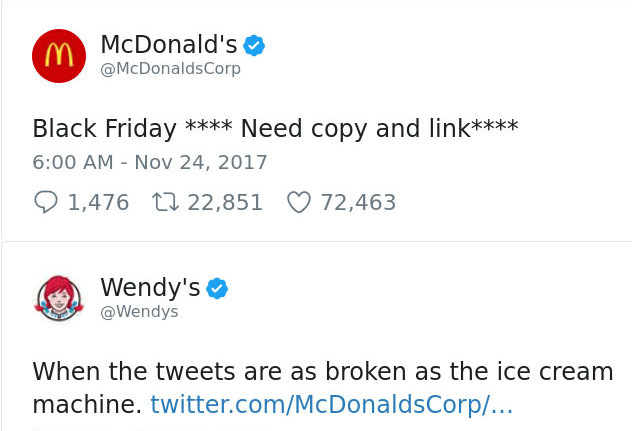 Another one from Wendy’s. Often enough, you just have to make your customer (or the ones watching) laugh. And another one so that you know – everything’s gonna be fine. There are users that might slip through the cracks when providing customer care on social media. You might not be able to help for many reasons – lack of time, knowledge, the time difference or anything else. Think about introducing a product tip of the week with an easy to remember hashtag. Also, create a help center or knowledge base of your brand so that your users will be able to find an answer faster. Here’s what we did at Planable using Intercom, perhaps it might inspire you to organize content. According to the Salesforce report, 54% of consumers expect businesses to respond to their queries instantly. Social media customer care created an “always on” expectation which means that 42% of consumers expect a response on social media within 60 minutes. Everything has to be answered as quickly as possible, including inquiries, reviews, and complaints. Facebook rewards you for great response rate. Your company’s Facebook support response time rate is clearly shown on your Facebook page. The situation’s not different on other social networks, 53% want a response within the hour on Twitter. Unfortunately, you can’t please everyone. There will be negative comments and reviews about your brand online, believe it or not. That’s why it’s crucial to create a set of instructions and processes to handle customer care through social media in the best possible way. First, there are brand guidelines – the way you express the brand on social, the way you speak and address the customer. Then you need to prioritize the kind of comments you want to reply to first. It’s critical to get back to the users that are frustrated or have some issues using your service. It’s really hard to follow all these comments, questions and feedback especially since most of them are (probably) repetitive. Create a series of saved replies to help you streamline the process of social moderation. Using saved responses is ensuring the solution will reach them fast. Always make sure that there’s nothing to leave to interpretation when writing the message. Unlike email, the responses will be public and it might really damage your brand if you replied in a wrong way. 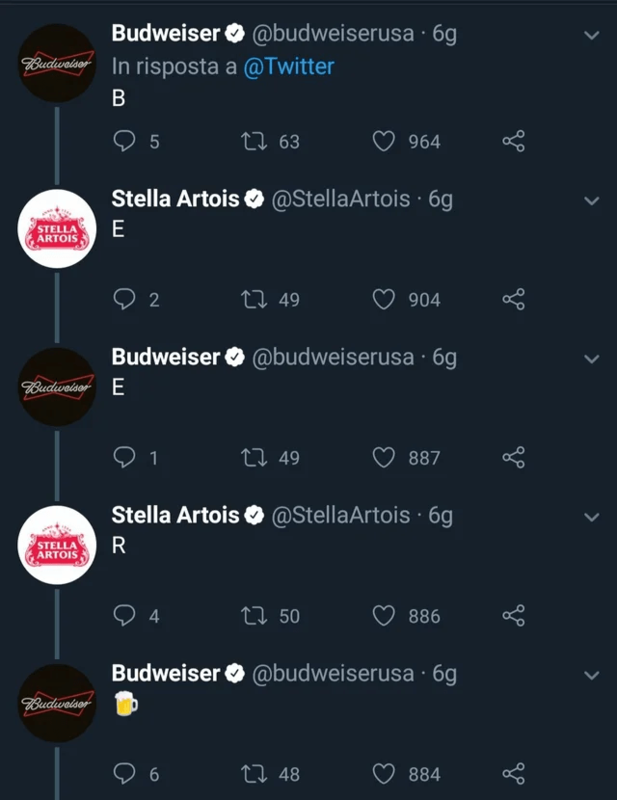 Every reply is a step forward to build a community around your brand. So make sure that the customer care team knows what they are doing as they are representing your brand worldwide. They are the voice of the brand with your customers. Sign up for Feedier and start collecting actionable feedback. Vlad Calus is the co-founder of Planable, a social media collaboration platform. Find him on Twitter.